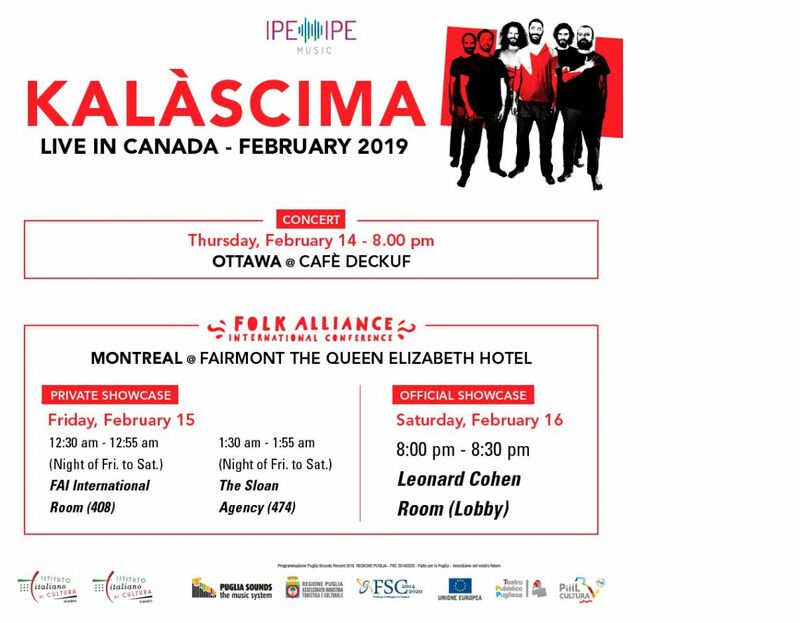 The Istituto Italiano di Cultura is pleased to announce Kalàscima's concert again in Canada. The Italian Band is one of the most innovative bands in the new landscape of Italian music. Theirs is an urban neofolk, reinvigorating traditional music from the Salento region through technology. Members include Riccardo Laganà (tambourine, percussion, vocals), Luca Buccarella (accordion, harmonica vocals), Massimiliano De Marco (classic and acoustic guitars, bouzouki, mandolin, ukulele, vocals), Federico Laganà (tambourine, riq, bendir, tar, darbouka, kanjira), Riccardo Basile (bass guitar, synth, bass, vocals), Aldo Iezza (Italian bagpipe, traverse flute, Calabrian double flute, thin whistle, shawm, xaphoon, vocals), Enrico Russo (electronics, synthesizers, drum machines, electric guitar, field recordings) and Andrea Morciano (songwriter, composer). The group has been active for 15 years and is one of the most acclaimend group that meshes the ancient traditional ritual dance music of Taranta (Salento, Southern Italy) with electronic music. Explosive, energetic and captivating, Kalàscima features many fascinating instruments (bagpipe, traditional flutes, Italian organetto), a spectacularly vast array of percussion from the South of Italy and all over the world (rick, darbouka), thrilling vocals, and modern instruments (bass guitar and loop machine). It's the ancient that meets the modern and the result is explosive, a sort of trance-folk music.